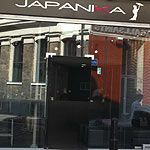 Japanika on Hanbury Street offers a variety of authentic sushi dishes. A typical menu may include scallop roll, chicken katsu curry and teriyaki bento boxes. Do you work at Japanika? What did you think of Japanika? A tiny Japanese cafe, Japanika offers a surprisingly good food selection for Spitalfields locals. Japanika’s bright colours immediately make it stand out from other nearby venues on the rather dreary Hanbury Street. Inside, the venue is miniscule with two window seats and one wall taken up by the takeaway counter and two tills towards the back with a mini Zen sand garden in between. Low sofas and stools with hot pink tables use up most of the space, and sculpted flowers echoing the black, pink and cream colour scheme are scattered over the walls. Despite the hot pink touches, the main colour scheme comes from the takeaway counter, with neon soft drink cans and sushi decorated with bright orange and green roe. The seating area, although comfy-looking, seems out of place and creates a bottleneck as people queue to pay for their food. The low seats and tables also look like they make for awkward sushi eating – best to get there early to get one of the higher seats by the window. There’s not much, to be honest, as the venue is so small. Those seated on the sofas and stools look awkward bending down to eat the sushi, and put off when the queue inevitably gets too close to their seats. Despite the cafe being enviably busy, staff behind the tills don’t seem too pleased with their success – surely a smile couldn’t hurt? Japanika should be applauded for its variety of food, which is much more varied than most Japanese takeaways. Besides all the expected sushi options (such as California rolls and salmon sets, but also the less common scallop roll) you’ll find sides like seaweed salads and Japanese pickles, plus hot food such as gyoza (dumplings), chicken katsu curry, tempura, yakitori (skewers) and salmon and chicken teriyaki bento boxes. The house special sushi set (£6.50) features California rolls, cucumber rolls, salmon, prawn, egg, scallop, tuna and eel nigiri, plus a few slices of salmon sashimi on a little nest of shredded daikon. It’s good value for a large amount and the fish is fresh, but there’s not enough wasabi on the nigiri so that every time you pick up a piece, what’s on top seems like it’s about to wriggle away. There’s also, strangely, no extra wasabi in the box. Standouts from the selection, though, are the creamy scallop nigiri and the light, sweet salmon. A soup described as chicken udon (£5.80), actually turns out to be much more than that, with the pleasant surprise of a raw egg cracked in the middle. It’s an ingredient that’s common in some Japanese soups but, for some reason, most Japanese restaurants in the capital think it’s too much for Londoners to handle. Usually the egg is poached in the hot soup, however, Japanika’s broth is just not hot enough so the egg sits raw in the soup, looking rather pitiful until it’s remedied by a reheat. Aside from that setback, however, the soup is delicious, with an intricate blend of flavourful, savoury spices plus shiitake, aubergine, seaweed, big hunks of carrot and a good amount of chicken, as well as a large number of thick udon noodles. They also do a selection of flavoured miso soups as well. You’ll find typical soft drinks alongside more unusual choices, such as iced green tea, a canned drink made from aloe, Pokka canned coffee and Calpico, a kind of a yoghurt-y soft drink. Genmaicha (brown rice tea) and matcha (green tea) are available hot. All drinks cost between about £1 and £2. Although it might be an awkward spot to stop for lunch, Japanika’s varied offerings make it stand out from the crowd.